Getting Hands-On with Soft Circuits is a PDF facilitator's guide containing several activities for teaching soft circuits to middle and high school students. Designed to build on previously learned concepts the first lesson introduces simple circuits and others continue to parallel circuits and microcontrollers. Lessons include full-color images with explanations and all procedures and tips for successful completion of activities. Be sure to go all the way to the end of the guide to find a list of materials used and suggestions for where to purchase items needed. Getting Hands-On with Soft Circuits is perfect for use with an after-school science program or as a resource for science fair projects. Create a center throughout the school year for students to work on circuits and build skills at an individual level. If you don't feel comfortable working on this topic, find a parent volunteer to help, or partner with another classroom to work together. Need funding to buy materials? See GetEdFunding, reviewed here, to write for a small grant. Trandori is a search engine for finding and sharing interactive educational problems, mostly math related. Use the search tool to choose subjects, grade level, topic, and keywords. Create and add problems using the Canvas Designer tool. Account registration isn't necessary, but it allows you to add problems to a queue, convert interactive problems to PDF, and take advantage of privacy options for sharing problems. Use Trandori to find interactive problems for sharing on your interactive whiteboard or as homework assignments. When using your whiteboard, have students use a free voting tool such as Mentimeter, reviewed here, to choose an answer using a mobile device or their computer. Curiosity Machine connects scientists and engineers with young people to help design and create projects together. Create an account to begin using features on the site. Discover challenges to build on your own, including categories such as aerospace, robotics, engineering, and more. Find inspiration by watching videos of scientists and engineers sharing their inventions. Share your finished projects as inspiration for other aspiring engineers and scientists. Be sure to take advantage of the free educator units offered with membership. Share project ideas with students as ideas for a school science or engineering fair. Share this site with students interested in exploring careers in science or engineering. Encourage students to enhance their technology use and learning by using a visual blogging tool such as Telegra.ph, reviewed here. With Telegra.ph you just click on an icon to upload images from your computer, add a YouTube or Vimeo, or Twitter links (no registration required), to document their progress while completing projects. Have gifted students choose projects from the site to complete as enrichment within different learning units. Develop an inflatable spacecraft for NASA with this exciting activity. Design a HIAD (Hypersonic Inflatable Aerodynamic Decelerator) to bring cargo back from space. Begin with HIAD Boot Camp and work your way up to advanced level using knowledge learned in stages along the way. Be careful, if your design is not strong enough, your spacecraft will burn up, and your mission is a failure. Introduce this site on your interactive whiteboard or projector. Have students explore this site independently or in small groups. Include this site with any STEM lessons or units. Share this activity with students interested in aeronautics or engineering as an excellent opportunity for practice and learning skills. Challenge cooperative learning groups to create videos with tips and suggestions for successful completion of this hands-on learning activity using a tool like wevideo, reviewed here. Share them on a site such as TeacherTube, reviewed here. HIAD would also be an excellent activity for an after school science club. Explore different types of electric cars including hybrids, plug-ins, and extended range electric cars with an interactive model showing how they work. Read the latest ideas for the next generation of hybrids that can be plugged in to extend their electric range, and improve fuel economy. The interactive models show power from batteries, batteries and gasoline, and extended range electric. Discover the relationships between distance, speed, and type of car in the interactive graph. Explore the concepts of electric cars, hybrids, and gasoline cars when studying conservation or sustainability. Collect real-time data using each different model. Gather predictions before introducing the model to students and before working with the interactive. Complete the activity and evaluate conclusions. Use as research for sustainability or conservation projects. Offer to gifted classes to spark interest in transportation models. Use as a model to show the different types of designs created to improve the fuel consumption of natural resources. 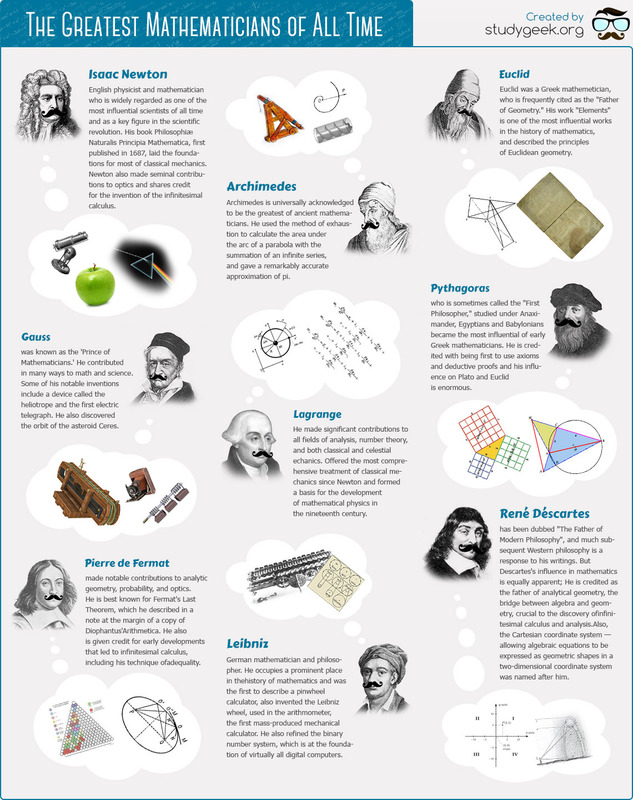 This graphic is a wonderful visual of nine of the greatest mathematicians of all time. Read a quick overview of the works of Newton, Pythagoras, Archimedes, Euclid, and others who offered significant contributions to our understanding of the world around us. Download this graphic and have it printed for use as a poster in your classroom. Display the graphic on your interactive whiteboard as an introduction to famous mathematicians. Have students research each mathematician and share their findings in presentations with a tool like Zoho Show (similar to Powerpoint, but easier and free), reviewed here. Khan Academy, reviewed here, offers an extensive playlist of math and science videos and tutorials on this YouTube channel. Scroll through to view available topics such as calculus, biology, SAT preparation, and much more. If your district blocks YouTube, then they may not be viewable. You could always view the videos at home and bring them to class "on a stick" to share. Use a tool such as Online-Convert, reviewed here, to download the videos from YouTube. Flip your classroom and use a video as homework. Have students take notes about the material and write down questions they still have and topics that confuse them. That activity can uncover misconceptions. Show the video to the class, and then discuss the concept at length. For more advanced classes, provide time for students to choose a video to view and research the underlying concept. Set up a video chat time using one of these YouTube videos and a tool such as Watch Together, reviewed here. Do not let the extremely simple look of this site keep you from exploring the links provided for making toys based on science concepts. Create items as simple as a kite or rotor, or as complex as robots, a hovercraft, or motors using directions within each link. All links have clear, precise directions with diagrams. Some links have accompanying videos hosted on YouTube. Be sure to look at the last toy link on the list, "how it's done," for excellent tips for the process of design. If your district blocks YouTube, the videos may not be viewable. You could always view the videos at home and bring them to class "on a stick" to share. Use a tool such as ClipGrab, reviewed here, to download the videos from YouTube. Bookmark this site for use with STEM projects. Create a link on your class website for students to create toys at home. Challenge cooperative learning groups to create videos and share them on a site such as TeacherTube, reviewed here. Share the link with your librarian or media center specialist to get a "maker" center started at your school. These projects would also be great for an after school club! Absorb Content - Crocodile Clips, Ltd.
Find great interactives and content about a variety of topics! Click on the different content areas at the top of the page: Electronics, Mathematics, Physics, Advanced Physics, and Chemistry. On each content page, click on the "Free Sample Units" link to view a variety of resources for that content area. Scroll down the page for the Free Resources header and click the word "Here" to go to the free interactives. Click on each resource, view the description, and then choose to view online or download each interactive. Find free interactives also by clicking on Resources on the top menu of each content page. With the paid version, get additional curriculum material. Some of the interactives require Flash, though the site itself does not. Use these interactives when discussing various topics in the content area you choose. Identify the relationship shown in the interactive. For example, under mathematics, choose the interactive for using a Protractor or Balanced Equations. In physics, find many interactives including Earth's Rotation and Factors Affecting Stopping Distance, among many more. In Chemistry, Forming Ionic Bonds and Electrolysis interactives are some of many that are free on this site. These interactives are great for use with an interactive whiteboard or projector for sharing with the class. 60 Minute Physics is a free online course inspired by the very popular YouTube Minute Physics videos. Physics topics include light and energy, space and time, quantum physics, and more. Enrollment in the courses opens up discussion areas, the ability to download videos for offline viewing, and online tracking of progress throughout the course. Easy registration requires your name, email, and a password to begin. Enroll in 60 Minute Physics to access the many videos and lessons available. These videos are perfect for use on an interactive whiteboard or projector. Use as a short introduction to lessons or to supplement current materials. Share 60 Minute Physics with students as an excellent resource for enrichment or differentiation. See sound waves moving through molecules in the air with this interactive. Be sure to notice the red handle at the top. Click the lever to the Illustration side to view sound waves moving through the air. Click the word "Clap" to see the sound movements. Moving your cursor around the resulting sound wave will display labels for the areas, items, and a definition. Read information about sound to the right. Move the lever towards Exploring Pitch and Volume. Choose to Strike hard or Strike gently, then click a glass. View the sound waves and the frequency of the sound. Want to print the results? Click the print button at the top. Use these activities to introduce sound before discussing in class as a way to create more connections with the material. Allow time for students to play with Exploring Pitch and Volume and create a simple sentence to describe what they learned. Encourage students to predict what will happen first before striking the glass! Looking for a quality resource about the Earth, organisms, the natural environment, and their interaction with society? This Encyclopedia is a free, quality collection of articles written by professionals, educators, and experts. The project is a collaboration, and articles are reviewed by other experts. Though written by professionals, the articles are not technical, proving useful to students and educators. It is also helpful to other professionals as well as the general public. View the authors and editors attributed to the articles. Be sure to notice the featured articles found in the center of the page. Find chapters or topics along the left side that cover every aspect of the natural and physical world as well as the many issues of human interaction with the Earth. Besides articles, find more at Encyclopedia of Earth including ebooks, lectures, and speeches. Use this resource when students are working on projects that pertain to any part of living things, the natural world, and man's role on the Earth. Be sure to bookmark this site on a class computer or your class website. Be sure to review the authors of the articles, following the links to their biographical pages to look at their expertise. Use this as an exercise in identifying whether information on the Internet is reliable and developing researching skills. As a challenge to your high achieving students, consider asking them to write entries that you can submit to this encyclopedia on classroom topics of interest to them. Students will have to analyze their language and writing style with more scrutiny than other assignments. Ask them to use Expresso, reviewed here, to help them achieve this. Consider creating an encyclopedia with content created by students modeled after the style of this tool. Use an online tool such as Weebly, reviewed here, to create a class encyclopedia. Note: As with other resources like Encyclopedia of Earth, content on the site is considered Attribution-Share Alike. Students should always cite their sources in accordance with this type of copyright.